YourFreeWorld's latest addition to its script arsenal is one that has been requested by many webmasters to provide a much-needed service to online marketers. This powerful, enriched script allows members to create eye-catching splash pages on-the-fly, and host them on your web server for easy access any time, any place. With high appeal to marketers of all levels, it is packed with quality features that will attract new members to your program, and has great potential to build revenue quickly month after month. 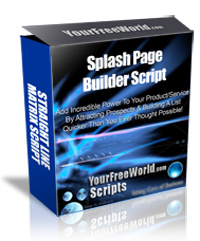 Like all YourFreeWorld scripts, it is extremely versatile with built-in options that allow precise customisation to suit your program's requirements, and displays member's affiliate links in the splash page footer to attract more members. If you want to stand out from the crowd, this is one script that you should seriously consider implementing in your business plan to create more profits & growth. Easy setup and management with step-by-step instructions. Set the joining fee for pro members, and choose the membership type from free only, pro only or both free and pro options. Set Commission amounts for the number of Referral Levels you require. Set the joining fee time coverage from monthly, yearly or lifetime. Set the minimum amount required to enable commission withdrawls. Set the number of splash pages that free and pro members can create in the system. Edit the signup form settings to show or hide extra fields such as address, city, state, postal code or country. Edit the settings to send a confirmation email on signup, and an upline referral email when new members signup. Edit the membership bonus pages for free and pro members. E-mail all members in text or HTML format. View pending, free, pro or all members, plus top sponsors. Compatible with PayPal, Payza & Moneybookers with provision to add 5 more preferred merchant accounts of your choice. Edit Your Pages by placing the HTML code into the system for the Account Upgrade, Ad Purchase, FAQ, Home, Logout, Member's Area Home and Terms pages. Customise the welcome, account activation, account upgrade, sponsor notification, and password reminder emails. Edit the top and bottom sponsor banner prices to generate more revenue, and view pending/approved banners in the system. Add/Delete banners and solo ads for members to promote your service. View pending and completed withdrawls. Add/edit/delete splash page templates for member use. 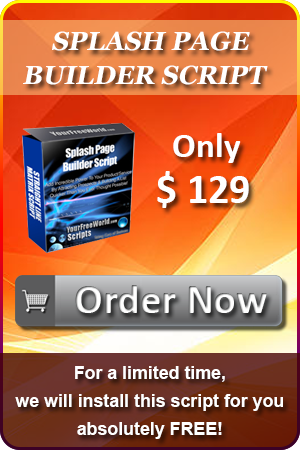 (Script comes with 10 built-in templates, with the option to purchase more for $10 each. Please see bottom of page). View/add/delete main splash page images. View at-a-glance system figures such as Total Members, Free Members, Pro Members, Pending Members, Subscriptions to Renew, Paid Money, Pending Withdrawls, Splash Pages, Splash Page Templates, Splash Page Pictures, Approved Banners, Pending Banners, Promotional Banners, and Promotional Solo Ads. Easy-to-navigate menu to Members Home, Splash Pages, Promotional Center, Stats, Withdrawl, Bonus, Profile, Logout. Menu explanation provided for members. Splash Pages: View splash page, change template from 10 pre-loaded templates, other settings (including title, short description, and keywords. Formatting options such as background, header and footer color, and main content text and headline color, and main body text content), and add main picture. Promotional Center: View affiliate link, banner graphics and HTML code, plus solo ad copy for promoting. Stats: View total amount earned, total unpaid balance, total paid amount, total referrals, and details of member referrals. Withdrawl: View unpaid balance, withdraw funds, and see withdrawl history. Bonus: See membership bonus details for downloads etc. Profile: View existing profile and edit details.